The California Genealogical Society is fortunate to be the recipient of many wonderful donated books to the library. In addition, thanks to the financial generosity of our members, books and media are purchased to round out the collection. New books are housed on a special book shelf so members can peruse the latest additions. Recently, CGS volunteer Sandy Fryer decided to take advantage of some quiet time while on "desk duty" and spend some time looking through the new books section. 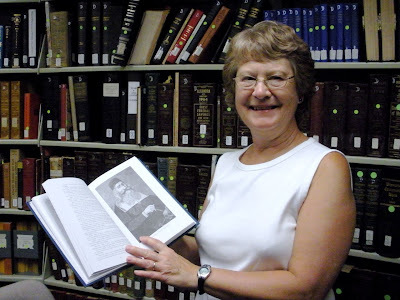 She had one of those serendipitous genealogical moments when she opened a book and found an ancestor. 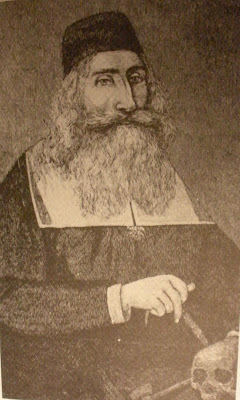 Sandy Fryer found the portrait of her ancestor, Dr. John Clarke. Sandy had heard of the portrait of her ancestor, Dr. John Clarke of Boston, Massachusetts, but she had never seen it. 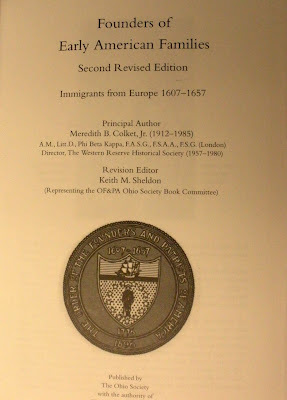 Colket, Meredith B., Founders of Early American Families: Emigrants from Europe 1607-1657. Second Revised Edition. Cleveland, Ohio, The Order of the Founders and Patriots of America, 2002. Photographs by Kathryn M. Doyle, July 15, 2008.